This year marks the 50th Anniversary of the US Open, and throughout Fan Week and the Main Draw of the tournament, special recognitions and ceremonies will take place to honor the tradition and history of the event, as well as celebrate its great champions. The USTA will kick-off the U.S. Open with Fan Week, a series of events and activations taking place both at the grounds of the US Open, the USTA Billie Jean King National Tennis Center, as well as at the US Open Experience at Brookfield Place, in Manhattan. US Open Fan Week began on Tuesday, Aug. 21, and extends through Sunday, Aug. 26, with the main draw of the US Open starting on Monday, Aug. 27. All events and activities during Fan Week are free and open to the public, with the goal of giving all fans the opportunity to experience the excitement and atmosphere of the US Open. The anchor event of Fan Week will be the 2018 US Open Qualifying Tournament, which started Tuesday, Aug. 21 and runs through Friday, Aug. 24, at the USTA Billie Jean King National Tennis Center. Featuring 128 men and 128 women competing in the singles competition, the event awards the top 16 male and 16 female finishers with entry into their respective Main Draws. Throughout Fan Week, at the USTA Billie Jean King National Tennis Center, visitors will have the chance to get an insider’s look at how the top players in the world prepare to compete for US Open glory. Practice schedules will be accessible via USOpen.org, as well as the US Open mobile app and social media platforms. On Tuesday, Aug. 21, at 8 p.m., the US Open celebrated the “global” nature of the sport with the help of NASA astronaut Andrew Feustel. For the first time ever, the iconic World’s Fair Unisphere, in Flushing Meadows-Corona Park, will serve as the literal backdrop for the first-ever tennis match in space. Feustel, ISS Commander of Expedition 56, will take part in the match with fellow crewmates Ricky Arnold, NASA Flight Engineer; Alexander Gerst, European Space Agency Flight Engineer; and Serena Aunon-Chancellor, NASA Flight Engineer. The match will be 3D projection mapped on the Unisphere, giving fans the chance to watch tennis in an “out-of-this-world” way. Fans can find out more about the gravity-defying action on the US Open’s Facebook page, YouTube and @usopen on Twitter. On Wednesday, Aug. 22, the USTA will officially open the new Louis Armstrong Stadium with a dedication ceremony on “Queens Day” at the US Open. The ceremony will feature USTA Chairman of the Board and President Katrina Adams, who will be joined by four-time US Open Champion and Queens native John McEnroe and a special performance by legendary jazz great Wynton Marsalis. Following the dedication ceremony, McEnroe will be joined by his brother Patrick and by James Blake and Michael Chang for the honorary first match to be played in the new stadium. One of the headline events at the US Open Experience will be the US Open Draw Unveiling. Taking place at 2 p.m., on Thursday, Aug. 23, defending singles champions Sloane Stephens and Rafael Nadal are expected to make appearances. A number of legends matches have been scheduled for Fan Week. Arthur Ashe Kids’ Day powered by Net Generation will be at held at the USTA Billie Jean King National Tennis Center on Saturday, Aug. 25. The annual festival of tennis, music and fun honors the legacy of legendary pioneer Arthur Ashe. From 9:30 a.m. to 12:30 p.m., kids can try out Net Generation tennis during the free Grounds Festival, plus enjoy live music and other activities for families. In addition, there is a ticketed Stadium Show from 1 to 3 p.m. featuring top musical acts as well as some of the biggest WTA and ATP World Tour pros in fun exhibition matches and skills competitions. Tickets for the Stadium Show can be purchased through Ticketmaster, www.USOpen.org and at the USTA Billie Jean King National Tennis Center box office. 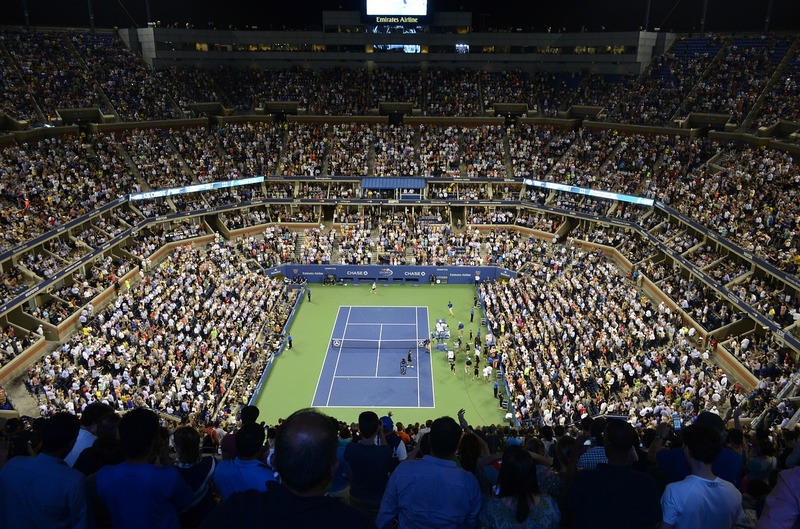 The 2018 US Open marks the completion of the Strategic Transformation of the USTA Billie Jean King National Tennis Center with the opening of the new 14,000-seat Louis Armstrong Stadium. In all, the five-year project, which revamped more than 90 percent of the facility, will have incorporated the installation of a retractable roof over Arthur Ashe Stadium, the construction of a new Louis Armstrong Stadium (also with a retractable roof), a new Grandstand, new West Stadium and practice courts, as well as a completely renovated and redesigned southern campus.